No matter what size your business is, at some point you may find yourself experiencing “growing pains”. Although an increase in productivity and gains are good problems to have, you want to be assured that you have the right tools to help you manage your growth. Sales, marketing, and operations are all individual pieces of your business that work best if managed collaboratively. Many popular business tools on the market may be a great performer in one of those areas, but are limited to just that particular specialty. Although these tools do have their benefits, there is an even greater benefit when your teams can efficiently collaborate and communicate by keeping all of your important data within the same system. The design behind Complete CRM gathers all of these moving parts of your business and consolidates them into a single platform. Connecting all of your teams through one simple tool can assure increased communication and productivity between your team members and also reduce the headaches of figuring out which data lies where. This makes your data more usable, and your team better able to make data-driven decisions. On a personal level, you may find it complicated just having to manage multiple social media sites. It’s difficult keeping up with your friends and family when your Mom might be an avid Facebook user but your colleagues are all on LinkedIn. Having to jump from one space to another means more time and resources to stay updated on and more chances for confusing and fragmented conversations. This should shed light on just how important it is to apply these same concepts to your business. When data is housed in various locations, it can quickly become redundant, disorganized, and fragmented. If your sales team uses one software and your marketing team is using another, it isn’t possible for anyone to have a complete 360-degree view of your customer. If your sales team found information about your customer that is relevant to marketing, additional processes of ensuring that the data is up-to-date and accurate becomes an issue, in addition to unnecessary time and resources used for cross-communicating. With multiple databases, it isn’t impossible to verify that they’re all correct. But how much time does that verification process take away from other things that you could be doing? When you have your data consolidated into a Complete CRM, each department has the access to the up-to-date, accurate data they require to do their jobs more effectively. With each additional account or software subscription that you create, you open another door that places you at risk for data breaches. Each tool that you use to manage your business and contact information is a portal to your valuable data. Unfortunately, no site is invulnerable to attacks and data breaches, but consolidating your information into one extremely secure system will help avoid these risks. You want to ensure that you are using a trusted service with maximum security standards, and you also want to ensure that you are taking preventative actions from placing yourself at an increased risk. Multiple subscriptions = multiple costs. Many platforms out there are priced on a per-user basis. These platforms are usually very appealing to the eye and look visually attractive. However just like many other products, design is not equivalent to performance. Pizza certainly looks much more appealing than salad, and sure, it may provide instant satisfaction. But it can be agreed that eating pizza over salad everyday would cause more issues to cleanup in the long run. So instead of going with something that looks flashy, go with something that is reliable and has all the features your team requires. Make sure that the platform you have meets all of your business needs and doesn’t require a separate subscription or additional fee for each function or user. Otherwise, you’ll find yourself paying much more than you need to. Not to mention, the more subscriptions you have, the more training you will need for your team, significantly increasing your Total Cost of Ownership. Along with other issues caused by separate subscriptions or disparate software solutions, it also becomes difficult to monitor accountability within your team. If you want to ensure productivity between each team member and the ability to track activities and measure overall performance, you need a single area to see what everyone is doing. Multiple platforms reduce transparency and make it difficult to manage your employees. A complete CRM will allow you to monitor what each department is actually doing. A strong complete CRM will provide you with the functionality to set daily task assignments and reminders, meetings, events, and projects. Having a single platform will also ensure that you can be an expert user of that system. Multiple systems mean multiple learning curves. Providing your team with simplicity will increase productivity and user adoption. Learning a new system is not always easy, but a consistently used platform will help ease the process. When each team is using the same system, they can be both an inner and inter-disciplinary resource. For each separate service and tool that you use for your business, the more you increase your risk of errors, additional costs, and security breaches. 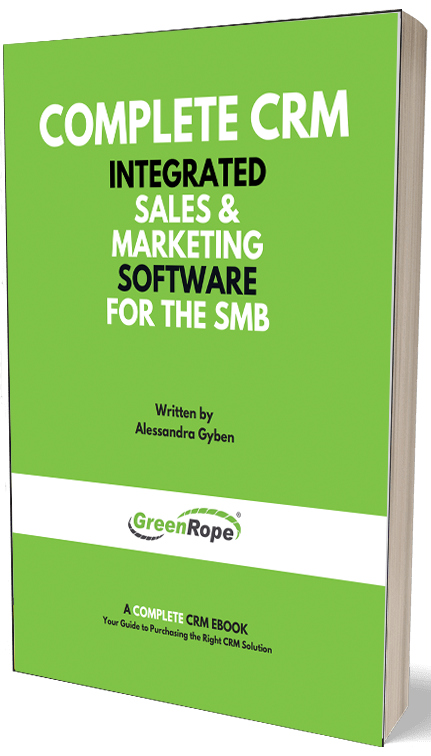 For effective customer nurturing and retention, your sales, marketing, and operations teams need to be effectively intertwined. By using a complete CRM, you can securely facilitate increased data accuracy, communication, and productivity. Eliminate the need to manage several platforms and focus on what matters most – managing your business growth.